See an early TV promo. That is true about the fire, many years ago the pine barrens on Long Island, NY burnt and now they are pretty much restored. I have seen recent billboards with Smokey the Bear, the grandkids knew just who he was. 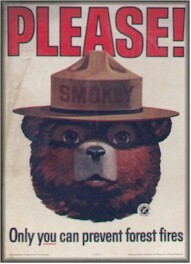 Only YOU can prevent forest fires! I think the U.S. Forest Service now pursues fuel management (clearing brush and dead trees) to outright fire prevention. Without the brush and dry deadwood, natural lightning-sparked forest fires don't result in horrific wildfires. In fact, scientists now think that occasional fires are actually good for the health of a forest, helping to curb encroachment by non-native species. In fact, it seems that the cones of some pine trees (e.g., lodgepole pine and jack pine) will only open and spread their seeds after they've been exposed to the heat of a fire.